Did you know that this store has 7 ROOMS and 3 FLOORS??? Three floors??? 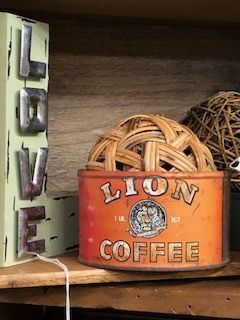 Yes, we do! 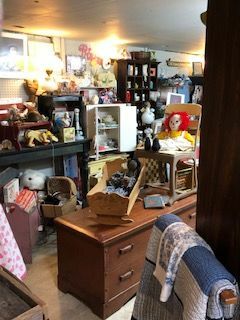 When you walk in, you will be on the first floor. 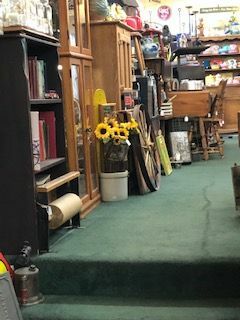 Standing here, you will find the original wood floor from the shoe store that once occupied this part of the building. 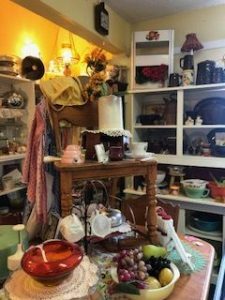 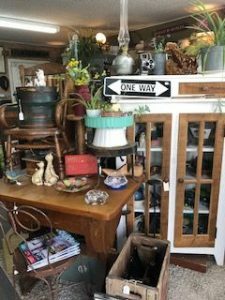 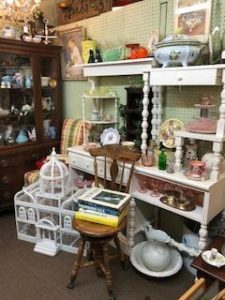 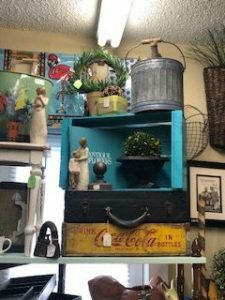 This space contains beautiful antique cabinets, jewelry, china, Fiesta ware, a random rooster or two, and Nancie, Carolyn, or Jen waiting to chat with you as you check out! 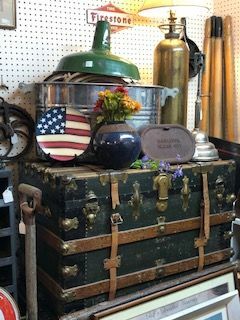 and more rustic riches in a room full of crocks and trunks and western figurines. 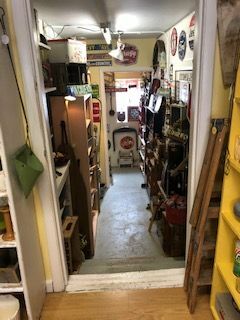 Heading down the wood floor hallway, you will find a few steps taking you down into the basement where you can still see the old garage door that opened to the garage where Terry used to work. 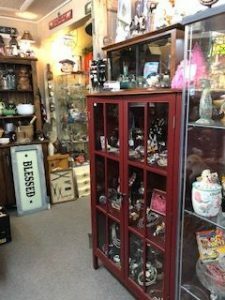 (Ask Nancie about Terry.) 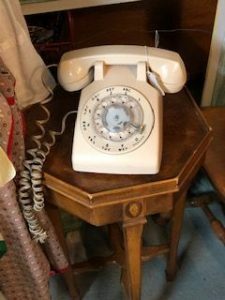 Down here you will find a room dedicated to vintage baby clothing and toys, sewing items, handmade doilies and quilts, and my favorite, teacups just waiting for a Sunday afternoon tea party and a group of giggling children. 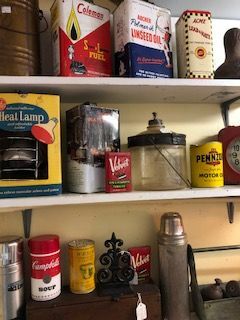 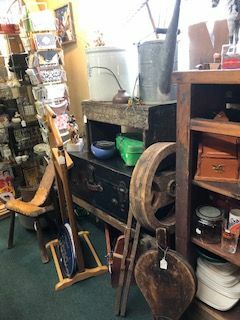 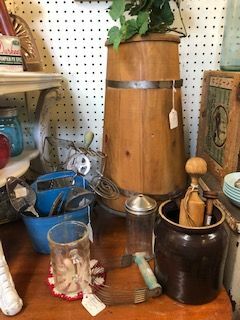 We also have fishing supplies, a stove or two, old windows, a corner full of frilly dishes and pictures that take you back to the Victorian days. This is just a little snapshot into the three floors and seven rooms of Lafayette Antiques. 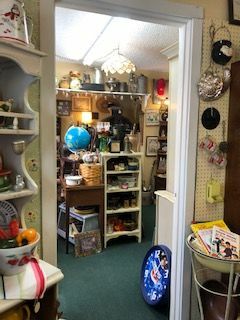 When you are ready to wander back in time, please stop in, introduce yourselves if we haven’t met yet and then head off onto your journey. Can’t wait to see you!